Jefferson had only been in office a few days but was already burdened with the capture of several American soldiers. They were being tortured and enslaved in Tripoli by Muslim extremists. He turned to his aide. "No more. No more money to the Barbary Pirates." The decision was bitter sweet as breaking free from the Muslim terrorists' hold meant he would also have to deny a deep personal principle. As a small government man, he would have to begin funding the Navy and Marines who have been struggling since their inception 3 years earlier. In the years leading up to his presidency, while he was still the Ambassador of France, Jefferson wanted to understand why these Muslims would conduct such unprovoked attacks. After hearing from the Ambassador of Tripoli that they were instructed by Allah to do so, Jefferson decided to read the book that formed their beliefs. He later encouraged American citizens to read the Qur'an as well. Not because he accepted Islam, but because he understood the people must know the dangers of it. For the next four years the Navy struck the Barbary Pirates from their ships. It became clear boots would have to put on the ground. US Navy Agent for the Barbary Regencies, William Eaton, devised a plan to attack the Pasha of Tripoli, Yusuf Karamanli. Yusuf had obtained power by ousting his brother Hamet Karamanli banishing him to Alexandria, Egypt. Hamet was sympathetic to the young America while Yusuf was indeed a Muslim terrorist. Eaton solicited Hamet’s help to overthrow Yusuf. He promised to return Hamet to power in exchange for help in a land expedition against Tripoli as well as reimbursing America for its expenses in the war. Finally, Hamet had to agree to cease extortion demands. A deal was struck. Under the command of First Lieutenant Presley Neville O’Bannon, eight Marines and two Navy midshipmen began Eaton’s force. From there, he assembled a group of roughly 400 men including Greek and Arab/Berber mercenaries, Turks, European artillerists, Arab cavalry, Hamet’s own troops, and camels and their drivers with supplies. Leaving Egypt on March 8, 1805, the group embarked on a 500-mile journey through the desert on foot towards the port city of Derne, the eastern-most fortified town and capital of Tripoli, in modern day Libya. Being both Christians and Muslims were participating in this campaign, religious tensions surfaced on several occasions, occasionally leading to fist fights. Supplies ran short leaving the troops without food and water. At one point, to survive, a camel was slaughtered for meat. Upon arriving in Bomba, where a U.S. Navy ship was to replenish supplies, ammunition, and wages for the mercenaries, those hired soldiers were ready to withdraw from the expedition when the Navy ship was not there. The eight marines, understanding their mission, quickly jumped into action. They convinced the mercenaries, with the help of their bayonets, to wait a day or two for the ship. By the next day the boat arrived with all the needed supplies, satisfying the restless mercenaries. Even after the treacherous 50-day journey across the desert on foot, their mission had only just begun. Completely outnumbered, out supplied, and exhausted, Eaton boldly sent word to the Tripolitan governor asking for surrender. The governor simply responded, “My head or yours.” The fight was on. Eaton took two days to devise their next strategy. The troops were divided into two groups. The Americans, Greeks, and Turks followed Eaton to the harbor where they would attack the munitions and fortress. Karamanli led his men and the Arabs to the western side of the city. From there they would deflect any Tripolitan reinforcements before attacking the city and governor’s palace. On April 27, 1805, the Navy bombarded the shore while Eaton’s men approached. Taking the lead, the Marines and Midshipmen stormed the shore, attacking the artillery units and the fortress. Eaton also picked up a musket and entered the battle, only to be wounded in the wrist. The American and ally forces fought for an hour before Lt. O’Bannon grabbed his Marines and scaled the city wall. The gunners were so surprised and terrified the fled their posts leaving the cannons loaded and functional. After securing the area, Lt. O’Bannon removed the American flag he had been carrying and raised it over the battlefield. This is the first time in American history the flag had been flown over a foreign front. 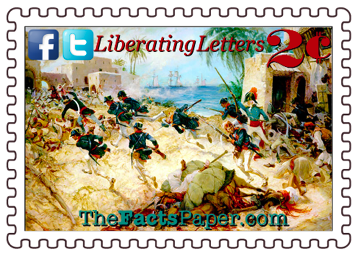 Eaton, Lt. O’Bannon, and their men then turned the armed cannons on Derna and began to fire. The Tripolitans retreated to the west only to be blocked by Karamonli’s men. With no place left to go, the Tripolitans were forced to surrender. The entire battle lasted two hours. Once the dust settled, Eaton had lost only two Marines with three sustaining wounds. The rest of his force experienced minimal deaths and wounds as well. This small army of 400, while experiencing nominal losses, inflicted an estimated 800 casualties and 1200 wounded on their enemy. Realizing his impending defeat after an unsuccessful attempt to retake the city two weeks later, Yusuf quickly sought peace with special envoy Tobias Lear which was achieved in June, ending the First Barbary War. The treaty required Hamet return to Egypt, which infuriated Eaton. His goal was to completely defeat Yusuf and reinstate Hamet as agreed, with neither objective obtained in the peace treaty. Regardless, he and O'Bannon returned home to a hero's welcome. Since that day, Marines have understood, respected, and revered this historic battle. The Marine Corps Hymn memorializes and honors this amazing victory with the lyrics, “…to the shores of Tripoli…” Astonished by his heroic actions, Hamet Karamanli presented an elaborate Mameluke sword to Lt. O’Bannon. Beginning in 1826, every Marine officer has included a model of this sword in their dress uniform, except for a brief period from 1859 to 1875. • Christ is right there beside you shouldering the burden for you. When you hold firm to the truth, and fight for justice and liberty, even if there are only a handful of you, you can prevail over a multitude.